It's nearly that time! What time, you ask? Henna tattoo season! Henna season starts in spring and goes on until early fall. That means it's time to get into henna-shape with these to-do lists for professional mehndi artists and just-for-fun henna artists. Spring Henna Season is Nearly Here! Start the season with fresh clean henna design books. Re-print beat up pages and add new ones. Do you need new applicator bottles or more cello flats? Do you have great staining fresh henna powder? Be ready for that first spring gig! Mix and freeze henna paste in small sizes such as cello cones for ease of thawing and freshness. It's been a long cold winter and we need to remind our brains how to do the basic henna elements. Practice the basic henna elements until you've recreated the muscle memory to make every design a great one. Practice rows and rows on paper until they are cemented in your brain. If you haven't booked spring and summer festivals yet, get a move on it! These can fill up quickly. What past clients will need spring break henna tattoos? Any one year anniversaries coming up from last year's brides? 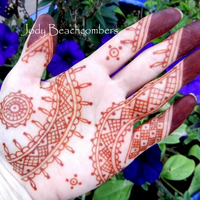 Remind people that spring means henna and start scheduling early! Run out of business cards? Get more! Do you need more chairs, new signs, a new tent? Get them now while you can shop around for the best deals. Time to break out some practice henna! When you run out of skin, henna on paper. The only way to have a fantastic spring break henna design is to practice in advance, so get going! Not mixing your own paste? Now is the time to learn! Our house brand, ORa henna is the perfect paste for beginners with it's extra high lawsone (dye)content. ORa makes it easy to get great color, even for beginners. Check out our selection of henna eBooks including a our mini eBook series that starts at only $.99! Visit The Henna Learning Center for all you need to know about henna! Get our new "So You Have Your First Henna Gig" eBook. This eBook contains 40 henna designs with suggested pricing, a sample contract, henna signage, and five pages of information on doing henna for an event/party. What have I missed? What else should we be doing as henna artists to get ready for henna season? So You Have Your First Henna Event? Daunting, isn't it? Having your first henna gig, I mean. Exciting, but daunting... I can't tell you how many hours I've spent on the phone, in person, and via email answering basic questions on this topic. Since I get the same questions over and over I decided to put the answers all in one place. Nice right? I realized that didn't go far enough, so I decided to answer the questions that new henna artists didn't know to ask and put it all in one fantastic eBook! Are you ready for a paid henna gig? How long will it take you to get through the guests? How much do you charge for henna? 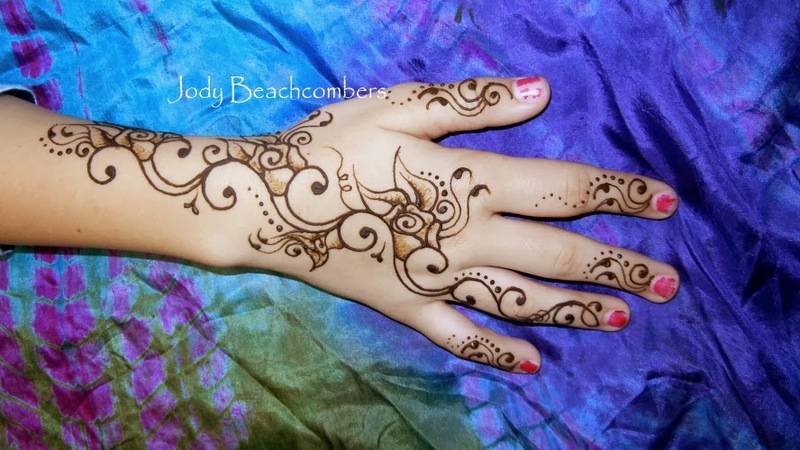 Which henna designs will you offer at your event? How do you create a henna design book? What kind of set up will you need? The First Henna Gig eBook also includes 40 great henna designs with pricing, a couple of signs, a checklist of what to bring, and a sample contract that you can use. It's a comprehensive eBook that is my favorite eBook to date! Buy the First Henna Gig eBook here. The art of henna has been around for over 6000 years and has grown from its use in traditional rituals to something that anyone can do just for fun. But despite its wide use in many modern cultures today, many false ideas and myths about henna persist. Is henna safe? Where can you use henna? Will more coats make henna darker? We’re here to set the record straight and debunk some of the more common henna misconceptions and answer some of the common questions. False. Real natural henna is one of the safest substances on earth, yet some people are still concerned about the safety of henna. Fresh henna paste made with unadulterated body art quality (BAQ) henna powder is extremely safe, even safer than the cosmetic products we use every day. The problem arises when people think they are using henna but are actually using a chemical product that may or may not contain henna. It’s very important to know what the ingredients are in henna powders and in henna pastes. Only use henna from trusted sources that understand the importance of quality unadulterated henna, and you will be perfectly safe. False. There is no such thing as black henna. Henna is always a red/brown color. Anything being called black henna and leaves a black stain is extremely dangerous and should never be used on the skin. To create a black stain chemicals such as para-phenylenediamine (PPD or coal tar), gasoline, or kerosene are used. Never use anything labeled as black henna. For safe beautiful henna stains, only unadulterated real henna should be used and this will always produce a red brown color, never black. To get good dark henna stains, use the freshest possible henna from a good supplier, allow the henna to stay on the skin for as long as possible, and follow good aftercare practices. Yes, you can use multiple coats of henna to darken a design. Henna is a transparent stain, so the more layers that are stained; the darker the henna stain appears. It’s possible to achieve beautifully rich dark henna tattoo stains using safe natural henna products without chemicals. False. There are many misconceptions that relate to the durability of henna art. Henna is not simply a temporary tattoo. Unlike face and body paints, people cannot remove their new henna designs by scrubbing them away using soap and water. Henna decorations wear off gradually, as the skin cells exfoliate away over the course of its normal cycles. Some people go to the other extreme and assume that their henna body art will stay with them for months and months, but henna is not a permanent tattoo. Usually, the henna art will not even last for a full month. Generally one can expect good color for 5-10 days and the henna stain will be completely gone in 1-3 weeks. Henna certainly lasts much longer than many other types of body art and people will be able to enjoy every minute of their henna decorations without having to worry about accidentally losing them due to moisture. False. Some people have false ideas about what their henna decorations will look like once the artist is finished with their designs. The henna skin decoration will begin as an orange color and darken to a rusty color over a couple days, as opposed to the bright red color. People should also know that fresh henna paste can only be used to create reddish brown henna art. If the henna art in question is any other color, it is a sure sign that the henna paste is not pure and is dangerous. False. Most pictures of henna online will show intricate patterns applied to hands, but that’s not the only place henna can be used. It’s safe for application to the skin anywhere including hands, arms, feet, belly, or anywhere else. You may be surprised to learn that henna powder is safe and frequently used to dye hair. Henna powder is a great natural way to dye hair a reddish brown color. Using henna on hair is especially beneficial compared to harsh chemical treatments because it seals in natural oils, leaving the hair conditioned and protected from sun damage. Henna is a permanent hair color that can be used more often than chemical hair dyes. Do you still have questions or concerns about using henna? 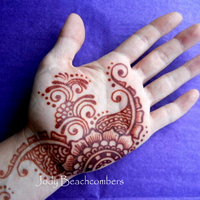 Find out more about our henna products here or email us at beachcombers@shopbeachcombers.com for help. Handmade glass bangles make a thoughtful and unique gift for all occasions. Made by hand in India and Pakistan, these beautiful bangles come in a wide variety of colors and textures. The hardest decision when it comes to glass Indian bangles is not whether you want them, it’s which ones you want! If you’re having a hard time deciding what colors and styles to choose, the 5 surprise bangles set is perfect for you. It’s great for any indecisive jewelry lover and it makes an even better gift. With the 5 surprise bangles, you’ll love the fun of opening the package for the first time, never quite knowing what you’re going to get. Since each bracelet is handcrafted, you’ll never end up with an exact duplicate. Plus, these unique bracelets will never clash with each other. The unique glass design features an endless variety of colors and patterns. Wear all purple or a rainbow of colors; any combination looks great! Collect more than one bangle surprise set and build your collection for even more options! No matter the color, each bracelet will allow your creativity and personality to shine through with each wear. All of Beachcombers’ bright bangles are crafted from glass, and they make a slight bell-like sound when worn together. They not only look great, but they sound great too! You’ll have a blast wearing them out for an evening of dance, to a fancy dinner or even just casually with jeans and a cute top. These affordable bangles make a fun and surprising gift set for special occasions, as a sweet thank you gift, or just to let someone know that she is in your thoughts. Our handy sizing chart makes it easy to get a set that will fit anyone, making these bangles a great gift for anyone who loves fashionable jewelry. Plus, you can rest assured that these glass bangles are wrapped and shipped with extreme care to prevent accidental breakage. At Beachcombers, we believe every day should be treated like a special occasion. You’ll love the surprise and joy that this glass bangles set brings to you and your loved ones. We can’t resist these elegant glass bracelets, and you won’t be able to either. Let's face it, Valentine's Day can be tedious with the same-old same-old year after year. Sweets, dinner, a movie, blah! It's not just Valentine's Day that can become tedious, but anniversaries, birthdays, and other special occasions that you spend "supposedly" celebrating each other. Instead of falling into the grind, spice things up with some sensuous fun creativity...henna! Have a friend henna pretty designs in hard-to-reach places for your partner to discover. Henna a dainty chain of hearts or flowers around your thigh, garter-style! Henna fun instructions for your partner like "Kiss Here"
Henna your partner's name on your bum! Henna racy comments on the bottom of your feet or your partners feet. You will know they are there, but no one else will! Henna a heart in the middle of each of your palms. When you are apart, the hennaed heart will remind you of each other. This is great to do before one of you goes out-of-town. Hide your partner's name in a beautiful intricate henna design...make him or her find it! You don't need much henna to tackle these fun ideas. For only 14.99, our Fun & Easy henna kit gives you enough henna for 10-30 henna tattoo designs and includes an easy-to-use applicator bottle that is perfect for henna newbies. Henna takes best on the hands and feet. The further away from those areas you get, the lighter the henna stain. That's ok, it's just something to be aware of when selection the henna location. Remember to do the henna 2 or 3 days before Valentine's day or whatever special event you want the henna to be ready for. Henna starts off light and takes 2-3 days to darken to full color. To learn more about henna check out The Henna Learning Center. Check out our Henna Hearts mini eBook for 3 pages of a variety of heart designs.